Designed to have you "create your own" locally-relevant case study or (even easier!) allow students to "bring their own" rough project concepts to be the basis of small-group (work team) activities. Designed to provide hands-on practice using PM job aids, tools, guidelines and other "take aways" that students can put to work, immediately, back on the job! 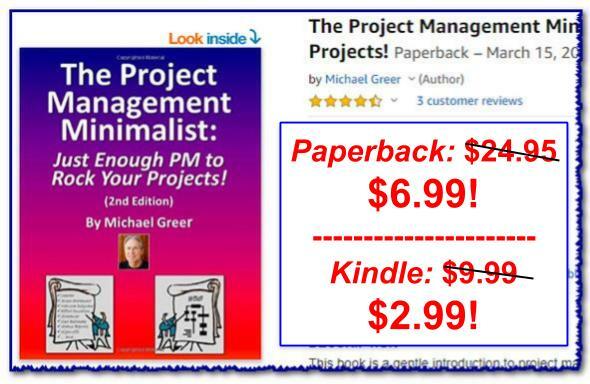 Designed to help you examine and improve your current PM (and related leadership) practices. Guided by the scripted coaching tools in The PM Minimalist Mentor. So anyone -- even a first-time trainer -- can easily facilitate the hands-on events! Using this recipe, you could create and present a training session that lasts a single day or as many as three days. It's up to you! It depends on how much time you want your teams to spend on each hands-on activity and how deeply you want to go into the management issues, obstacles, etc. that you face in your specific organization. But no matter how long it takes, the session is designed for lots of hands-on, activity-based PM engagement! For over three decades I've been building and teaching customized, on-site PM courses for organizations in many different industries. Now I realize that not everyone is able to spend several thousands of dollars to have me research, design, develop and present such a customize session. So for those of you on a tight budget, I've decided to provide this detailed recipe you can use to create your own customized, interactive, PM training session. And while the outline calls for the use of many of my pre-packaged PM Minimalist materials, you can certainly substitute your own PM references. The Bottom Line: Teach 10 Students, Spend Less Than $500! If you build the course according to the recipe above, you'll be able to give a solid, hands-on PM Basics training experience to up to 10 people for less than $500!! And in the process, trainees will learn to use some powerful PM tools, templates and processes that they can apply to any project.